Volkswagen has developed a new petrol engine that is as fuel-efficient as a diesel, but without the loftier price tag usually associated with oilburners. 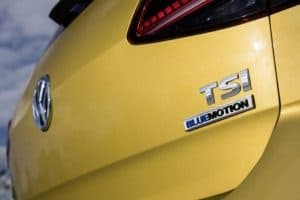 The new 130PS 1.5-litre TSI ACT BlueMotion has just been made available in the Golf hatchback and claims to return 58.8mpg on a combined cycle, rising to 70.6mpg in extra-urban surroundings. VW says the engine is 10 per cent more efficient than comparable petrol engines and reckons any driver can achieve low fuel consumption figures with this 1.5-litre unit. All this is made possible due to what is called ‘eco-coasting’. When the driver lets the car coast, the engine management system switches off the engine completely and decouples it from the drivetrain by disengaging the clutch. The vehicle’s kinetic energy is optimised and the Golf repeatedly switches over to a zero-emissions mode for brief periods of time. In practice, temporarily shutting off the engine reduces fuel consumption by up to 706mpg. VW get a lot more technical than that in their explanation, but that’s the general idea. The concept will soon be rolled out to other key models in the VW range. Aside from this cylinder deactivation technology, many Volkswagen models are available as plug-in hybrids, such as the Passat GTE and Golf GTE.